The theme of the sixth-annual Mountain West Arts Conference, held May 3 at the Utah Cultural Celebration Center in West Valley City, was “mapping.” The theme manifested itself with artists and arts organizations navigating paths to sufficiency in an uncertain political and economic climate. Although the “maps” used to define the arts ranged from found-object sculpture to making art accessible to the disadvantaged, everything kept circling back to how art and artists can find ways to live in the world. In her welcome speech, Margaret Hunt, director of the Utah Division of Arts & Museums, asked participants, “How can we put Utah on the map as one of the most creative places in the country?” Julie Fisher, executive director of the Department of Community & Culture (of which the Division of Arts & Museums is a part), said in her introductory remarks, “We as artists define what our culture is.” As true as that might be, there remains a sense of artists struggling against a culture that isn’t always supportive of their creative expressions. Facilitators Jan Dworkin and Randee Levine of the New York City-based group 361 ArtWorks, asked attendees to think of words representing their “highest hope” and greatest obstacle to their goals, and combined the words into poems. The exercise demonstrated how the content of artists’ daily lives can inform the content of their artworks. The conference then split off into concurrent sessions on topics including using arts and culture data in arts advocacy, and event planning, as well as a session on accessibility with Sheryl Gillilan, the new director of Art Access. In their presentation titled “Art in the Circle of Life: Integrating Art, Life and Business,” musician Kate MacLeod and artists Joe and Lee Bennion discussed the intersection of those three elements. “Art doesn’t emerge in a vacuum,” MacLeod said. She mapped out her daily activities and interactions with a pie chart and a flow chart. The next set of sessions included a hands-on workshop on creating art from found objects as well as topics such as succession planning and the ways culture can connect with audiences. During Utah Poet Laureate Katharine Coles’ reading and discussion titled “A Poet in Antarctica: Art, Science & Opportunity,” she read her poetry about her trek to Antarctica in winter 2011, which was funded by a National Science Foundation grant. These works mark a singular intersection of art and science in a forbidding climate. “That physically overwhelming place makes you think about perception, and how we construct knowledge,” she said. The reading was a powerful way to round out her five-year term as poet laureate. Gov. 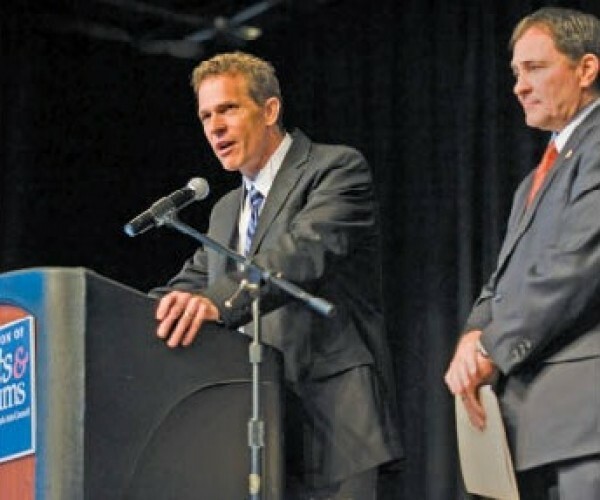 Gary Herbert appeared at the conference luncheon to present the recipients of the 2012 Governor’s Leadership in the Arts Awards. Winners included the city of Ogden for Community Leadership in the Arts; Chris Roberts for Education Leadership in the Arts; Artspace for Organization Leadership in the Arts; and Teri Orr, executive director of the Park City Performing Arts Foundation, for Individual Leadership in the Arts. An integral layer of the day’s mapping was the intersection of arts and sciences. Keynote speaker, University of Southern California neuroscientist and psychologist Mary Helen Immordino-Yang discussed the neurobiology of social emotions and actions and their benefits to self-awareness and development. She presented scientific evidence with poignant examples of empathy and actualization. The UCCC gallery featured Noticers: The Intersections of Art & Science, full of graphic examples of the ways arts and science not only intersect, but are vital to each other’s progress. A final series of breakout sessions touched on giving presentations, managing volunteers, and the intersection of artistic media and science, as well as an exploration by Dworkin and Levine of the stratgies they implement to facilitate their clients’ creativity. Participants chose the “issue” of arts funding for a discussion, mapping out the oppositional roles of artists and those who fund the arts.